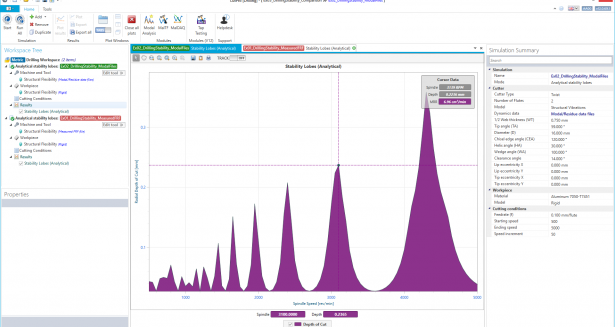 CutPro: Drilling Simulation Module – MAL Inc. 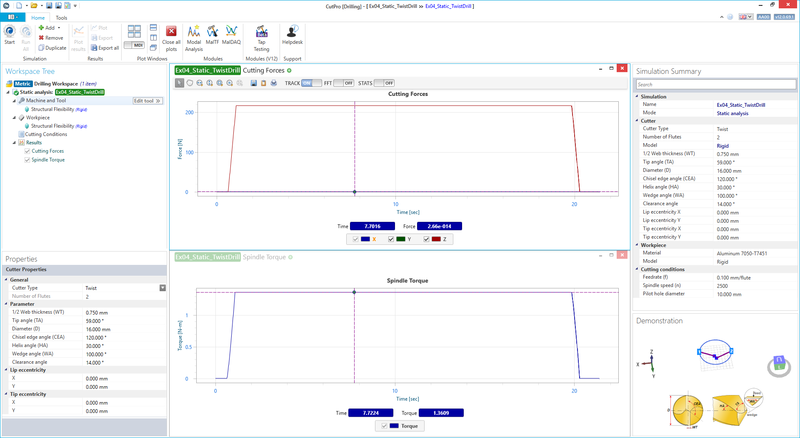 The CutPro® Drilling Module allows simulation of stability, cutting forces, torque, power, and tool deflections during the hole-making process. Our module can simulate twist and indexable drills with user-defined tool geometry. Once you enter your tool specifications and material type, the drilling module can predict the most optimal spindle speeds for reduced vibrations, better surface finishes, and improved hole quality. 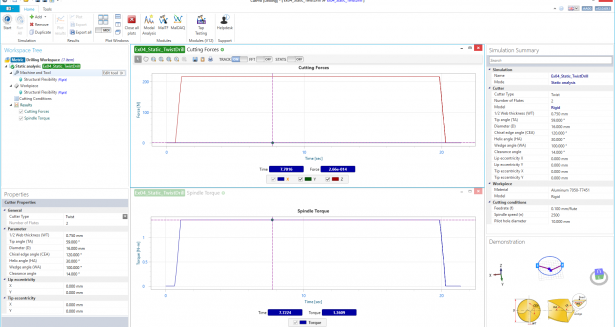 Simulating the drilling forces, required spindle torque and power ensure you do not exceed the limits of your machine tool while avoiding unnecessary tool breakage in drilling operations. The specialized orbital drilling function predicts the most productive and chatter free orbital pitch, spindle and orbital traverse speeds. Dimensional errors on the surface can be predicted to achieve desirable hole tolerances. Access to more than 200 work materials in the CutPro database. Twist drill and indexed tool geometry can be defined by the user. Any arbitrary cutting edge geometry can be defined and used. 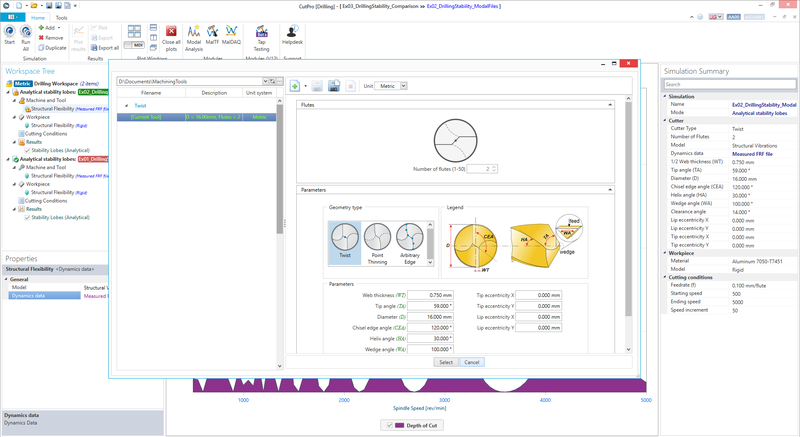 User can enter stiffness, damping and natural frequencies automatically from the CutPro Modal Analysis module, or manually from other sources. Lateral, axial, torsional and torsional/axial modes can be entered. 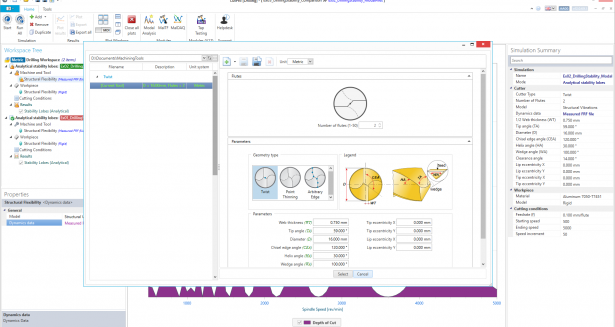 In the tool editor you can specify the numerous parameters of any tool. Determine the best stable spindle speed and depth of cut, according to your needs and limits. 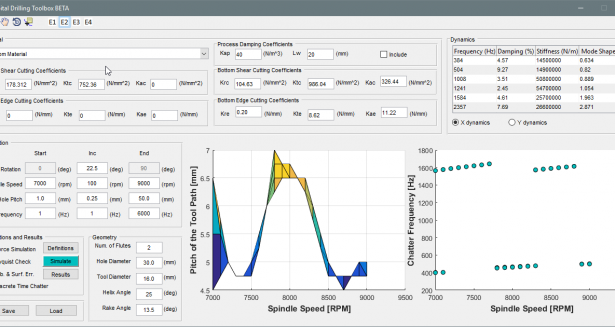 Simulate cutting forces and spindle torque, helping you stay within your machine and tool limits. Minimize chatter, and maximize spindle speeds in orbital drilling operations. 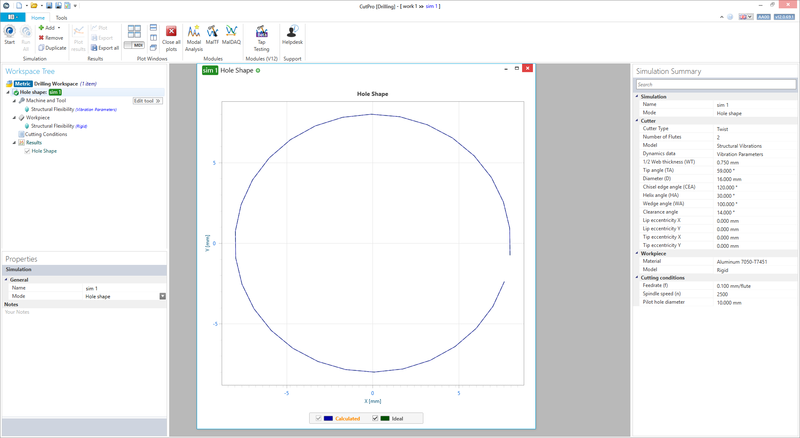 Predetermine your hole shape with your specified tool, material, and cutting conditions.